For two years Julius Thurgood, organiser of the HRDC, has been trying to recreate the famous Willhire 24 hour races of the 1980s. Now it's all about to happen. The Reunion event to celebrate Britain's first 24-Hour race has been confirmed for 18 October this year. 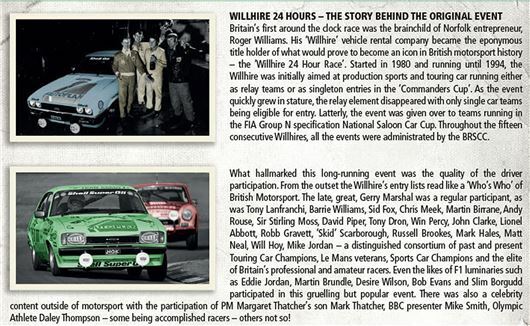 The 2-hour race - evocatively running into darkness - will celebrate the 'Production Class' sports and touring cars (plus the later Group N cars) which contested the fabled Willhire 24-Hour Race events from 1980 to 1994. The event has been devised by ex-Willhire driver and HRDC Race Director, Julius Thurgood, in conjunction with the original administrator of the 'Willhire' - the BRSCC. Drew Furlong, Competition Director of the BRSCC, goes on record: "Whilst I may not have been present for all the Willhire 24-Hour events, I have been privileged to have been involved with at least four of them, so I understand the camaraderie of the event and the many memories that it holds for competitors." Julius Thurgood has been busy behind the scenes in getting this event off the drawing board and onto the track. "The spiritual home of the Willhire is Snetterton, but we ran into planning problems with the night racing aspect of the Willhire Reunion. Despite the best efforts of the team at MSV, we were at an impasse with Snetterton's licence. "Thankfully, Christopher Tate and his team at Donington came to the rescue and we now have the go-ahead to run this race into darkness on the National circuit at Donington Park on 18 October. Having canvassed the opinions of many of the original Willhire drivers, the vote was unanimous that this specific element of the original events be incorporated into the Willhire Reunion". To date, the HRDC has contact with the owners of over 35 original Willhire cars and the count is rising on a daily basis. But Thurgood is keen to get the message across that cars of the type which ran in the original Willhire events would also be made welcome. "Of course, we will give preference to an entry with an original Willhire car, but we do realise that there are some very good cars out there that would also fit the bill for the Willhire Reunion, so hopefully we will be able to take these onto the grid at Donington in October, too - especially if they are prepared to 'adopt' an original Willhire livery". A cross-section of the original Willhire cars already committed to this event are: the ex-Pete Hall / Andy Rouse Opel Commodore GS/E 2.8, the Willhire 25th Anniversary winning Ford Sierra Cosworth of Slim Borgudd / Mark Hales, the ex-Jon Dooley 'Napolina' Alfa Romeo Alfetta GTV, the 'Bulldog' Team Morgan Plus 8, the 1985-winning Ford Capri of Roy Eaton / David Oates / John Clarke, the Nissan Skyline of Andy Middlehurst and the MGB Roadster of Julius Thurgood / John Trevelyan / Graeme Davis / Rae Davis. What rubbish....Its a two hour race....NOT at the circuit that was the WIllhire...NOT at the time of year that WAS the Willhire nor is it 24 hours...its JUST TWO!